The seven films Mambety made between 1968 and his early death from lung cancer 30 years later—two of feature length and five in the short-to-medium range—depend on their intricate soundtracks. 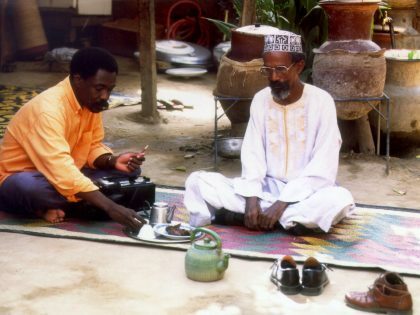 Environmental noises, such as birdcalls, wind, and waves shudder and throb against overlapping patterns of dialogue and, in many cases, music by Mambety’s brother, Wasis Diop. “I attach a lot of importance to sound in my films,” he said, “as I heard films for a number of years before I saw them.” He attached importance, too, to escapes like the ones that first brought him to the cinema. “You have to have freedom to make a film,” he often said. His early life was a series of rebellions. When his classmates snuck cigarettes into the bathroom and kept a lookout for teachers, he insisted on smoking in plain view. He dropped out at 16. “All of my teachers at the lycée in that period were European,” he remembered. Freedom was also a matter of form. In his editing Mambety was rigorous and precise but often disdained traditional notions of continuity, smoothness, and good flow. His early movies stutter, veer, heave. 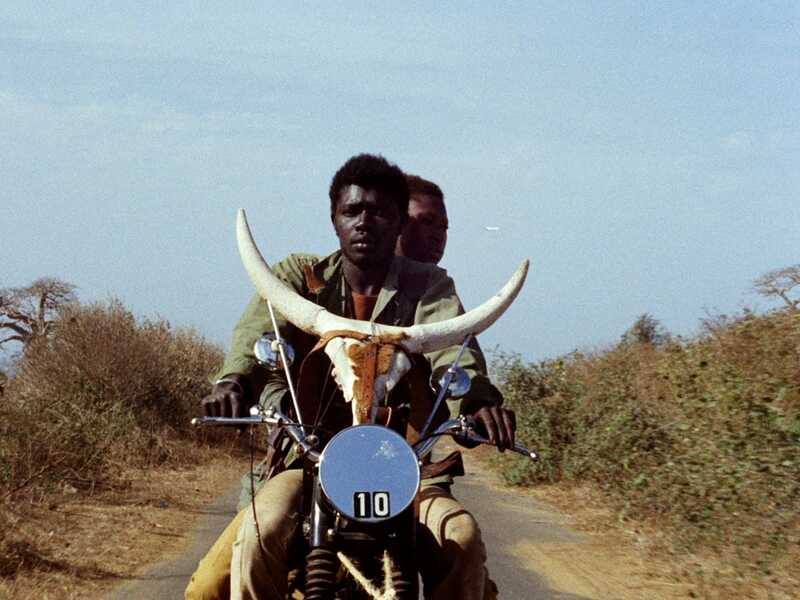 The lovers at the center of his first feature, Touki-Bouki (1973), spy on a suitcase they want to steal—and in the next shot, it sits on the back of their bike. The credits of that film unfurl against languid shots of a young boy leading a herd of steer down a dirt road. The next sequence shows bloody, maimed animals writhing on the tiles of an abattoir. A central speech in Hyenas (1992)—Mambety’s masterful later feature, newly restored by Eclair Digital in France and Thelma Film AG in Switzerland—gets punctured by shots of a woman in red throwing herself against a desert floor. Mambety traveled widely throughout Europe, but unlike such other prominent West African filmmakers as Ousmane Sembène, Safi Faye, and Med Hondo he declined to immigrate to France to go to school or find a job. He stayed in Dakar, joined a theater company—the Théâtre National Daniel Sorano—from which he soon had a falling-out, and learned filmmaking on his own. If he wasn’t going to leave the city he had to remake it, re-draw its limits to fit the scope of his ambitions. In his first two films, Contras’city (1968) and Badou Boy (1970), Dakar became a splintered maze through which bodies and buses accelerate and swerve. Mambety wanted to cram a film with its architecture, its markets, its mosques, the relics and scars the French colonial regime had imposed on it. Those films were electric and freewheeling but also diffuse. Neither the voice-over conversation between Mambety and a French woman in Contras’city nor the antic movements of the title character in Badou Boy give the movies much shape, so the considerable energy they build risks thinning as they spiral on. The women at the center of Mambety’s pair of features, which he made two decades apart, give those movies a pressure missing from the early shorts. The women push against the limits of the places and people that enclose them. Anta (Mareme Niang), the young woman at the center of Touki-Bouki, craves a new life in Paris. The figures who populate her life project violence that Mambety hadn’t previously tried: we see her aunt, played by the singer Aminata Fall, gut a cow’s carcass with a dull knife and her boorish classmates beat up her boyfriend Mory (Magaye Niang) in a jealous rage. Mory himself is obliging but dragged by inertia. He and Anta make love by the ocean in a scene of fractured ecstasy—we only see her hand as it grips the iron cross on the back of his motorcycle, intercut with the crashing of the waves and the sound of the couple’s breaths—and steal a new wardrobe together, but when the time comes for them to ship off for France it’s only she who stays on board. Then Mambety makes a decisive choice. He leaves Anta and lingers with Mory as the city reabsorbs him. The freedom she wants is too expansive for even this movie to contain—this “girl,” as Mambety put it, “who had the courage to leave Africa and cross the Atlantic alone.” Mambety said he made Hyenas 20 years later because he “absolutely had to find” her. Where he found her suggests how far his sensibility had moved from the one that shimmered through Touki-Bouki. He adapted Hyenas from a 1956 stage play, The Visit, by the Swiss writer Friedrich Durrenmatt. A formidable older woman named Linguère Ramatou (Ami Diakhate) returns to Colobane, her impoverished hometown, after decades away. She agrees to share her vast fortune with her former neighbors, but only on the condition that one of them kill Draman Drameh (Mansour Diouf), the popular grocer who long ago got her pregnant, left her, defamed her when she brought a paternity suit against him, and forced her into exile. Mambety drifted away from violent juxtapositions and elisions during the years that separated Hyenas from Touki-Bouki. His pace slowed; he moved towards strewing a movie with pockets of space. He revised his outlook on matters of wealth and power, too. In Touki-Bouki money had been the motor for a heist plot. But it exerts a wrenching, grinding pressure on the people at the center of Hyenas. The sparse streets of Colobane contrast with the busy ones of downtown Dakar. One of the film’s first scenes is of unpaid creditors seizing all the furniture from the local town hall. The images have a new patient languidness because there seems little chance of bending, or breaking, the limits of the place they show. The international wealth Ramatou now embodies—the townspeople consider her “richer than the World Bank”—only draws those limits tighter. She has, it emerges late in the film, already bought up tracts of land around Colobane. By the end of the movie, bulldozers are encroaching on the neighborhood; development is underway. “My task was to identify the enemy of humankind: money,” Mambety said. Near the end of the film, Drameh visits her at her lookout point above the sea and tells her that he’s about to go to his death. She promises to have his body ferried to an island she owns. “You’ll stay with me forever,” she tells him. In Touki-Bouki, Anta’s command had come from the freedom she projected. She left Dakar because she had used up what it could give her. Ramatou’s victory is joyless in comparison. Only her money, she knows, turned her from the brunt of Colobane’s scorn into the savior for which her old neighbors might go so far as kill. Something had darkened in Mambety by the time he made Hyenas. He had always moved in parts of Dakar few in his circle ventured to; “he knew,” according to the critic Baba Diop, “where to meet common men and women, failed artists and those unlucky in life.” But over time Mambety’s sense seemed to sharpen as he brooded on the vast, intractable inequities the French colonial regime had left behind. Homeless and indigent children preoccupied him. 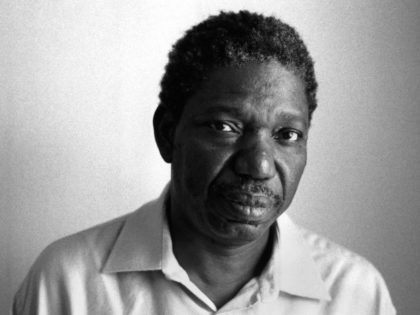 Shortly before he died, he established a charitable center in Dakar. He named it after one of his heroes, Yaadikone, a benevolent thief of the colonial period who looked after the poor and once pressured a cinema manager to open the theater to children for free. Hope lay, in Mambety’s words, with the “little people.” His last two shorts, Le Franc (1994) and La Petite Vendeuse de Soleil (1999), centered on young dreamers in Dakar who find their gambles improbably rewarded: a broke, gangly boy who hides what turns out to be a winning lottery ticket in his room behind a poster of Yaadikone, and a young girl who walks on crutches and makes her way selling newspapers. News swirls around them—the French government’s shattering decision to halve the value of the African Franc, for instance—but it hardly seems to touch them as they careen through the city, he with guileless perplexity and she with a kind of savvy resolve. Finding these characters who managed to widen their slivers of freedom pushed Mambety back to something like the loose, heterodox visual style he’d perfected in Touki-Bouki. Close-ups of faces in ecstasy or horror, superimpositions, dream scenes, and jump-cuts settle, in these films, into glittering and seductively self-possessed patterns. She breaks them into smaller stones that can be used in construction. People who want modern buildings in their neighborhood ask her to move her workshop away. But she can conquer the ugliness and dirtiness of human beings because she is close to the truth. Determined hope of this kind was essential to Mambety. It is hardly surprising that he tends to figure, in accounts of Senegalese cinema, as a great rebel and an apostle for personal independence. But he also took the challenge of pessimism seriously, as Hyenas shows. His late turn back to more optimistic subjects carries force because he had already imagined what happens when people did not manage to defeat money, when the restrictions under which they struggled never gave or stretched, when freedom lost out to empty consolations and dishonest justifications. Pessimism was, in cases like these, the bedrock Mambety hit. 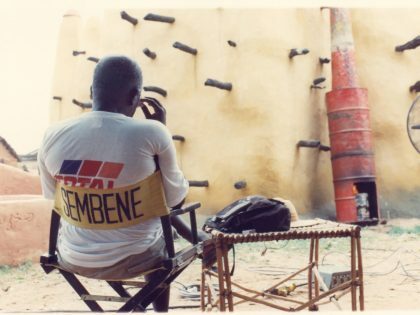 It testifies to his energy and fortitude that he never let even his bleakest conclusions—about the economic indignities imposed on Senegal, or about the persistent aftereffects of French colonial rule—make his films go dull or slack. He delivered his grim assessments with an imaginative brio that seemed to emerge from the same sort of freedom his characters sometimes failed to win. When the townspeople close in around Drameh, then disperse, the murder seemingly done, all they leave on the ground is a heap of clothing. Mambety warned his viewers in an interview not to ask what had happened to Drameh. It would spoil the point. “Only magic knows where his body has gone,” he said. This was originally published in Salmagundi.